In 2017, visitors to the Channel Islands have the opportunity to see something that was rare just a few years ago: wild island foxes interacting with each other. When island foxes faced extinction in 2000, surviving individuals were brought into captive breeding facilities. From 2000-2006, seeing an island fox was a momentous occasion. Since 2008, all island foxes have been returned to the wild (with the exception of a few in mainland zoos). As the populations recovered across the islands, the opportunity to see island foxes hunting and interacting with each other has increased. 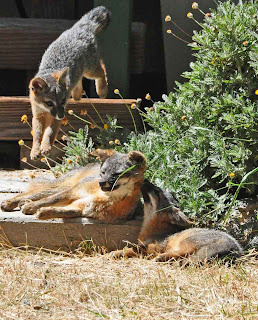 (seeing island fox behavior on Santa Cruz Island 2015). 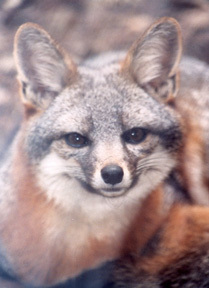 Vocalization: Yes, island foxes vocalize. They bark, growl, and pups make soft whimpering and eecking sounds. Barks are typically high pitched and evenly spaced. Barks may be repeated multiple times. In the distance, we heard an island fox bark eleven times in a row. This vocalization is used to warn an interloper that they have trespassed on an individual's territory. Island foxes may bark at each other or, occasionally, at humans. If an island fox barks at you, you are too close. Hear an island fox barking. The Growl of an island fox is low and soft. 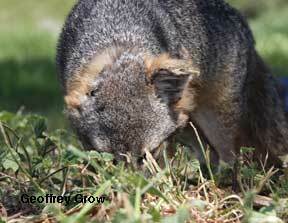 Typically this sound is used to warn off another island fox that has approached too close. We saw an island fox curled up sleeping by the side of a dry creek bed. A second island fox approached it, coming within five feet. The fox laying down, growled at the approacher. The second fox stopped, turned around, and went the other direction. Aggressive Territorial Behavior: Island foxes are very territorial. (Territory size) Living on an island with limited resources means quality territory is vital to survival. A pair of island foxes mates for life to protect their territory and the resources needed to feed themselves and their offspring. Challenges over territory can occasionally lead to aggressive behavior. Vocalizations (see above) are used to warn other foxes and avoid physical confrontation. 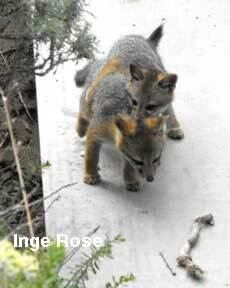 Chasing can occur when an island fox intrudes into the territory of another island fox or pair. We saw one adult island fox chasing another adult island fox out of the campground area. 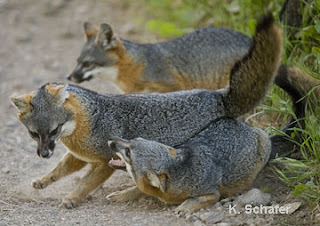 Physical Altercations can occur between island foxes, especially over territory. Island foxes with floppy ears are typically older individuals who have had altercations with other island foxes. The cartilage of the external ear can be damaged by bites or twisting from other foxes. Over time, repeated damage leads to ears that flop down or may even be torn off. Bites to legs are also frequent injuries. Limping island foxes are often individuals that have been bested in a squabble. 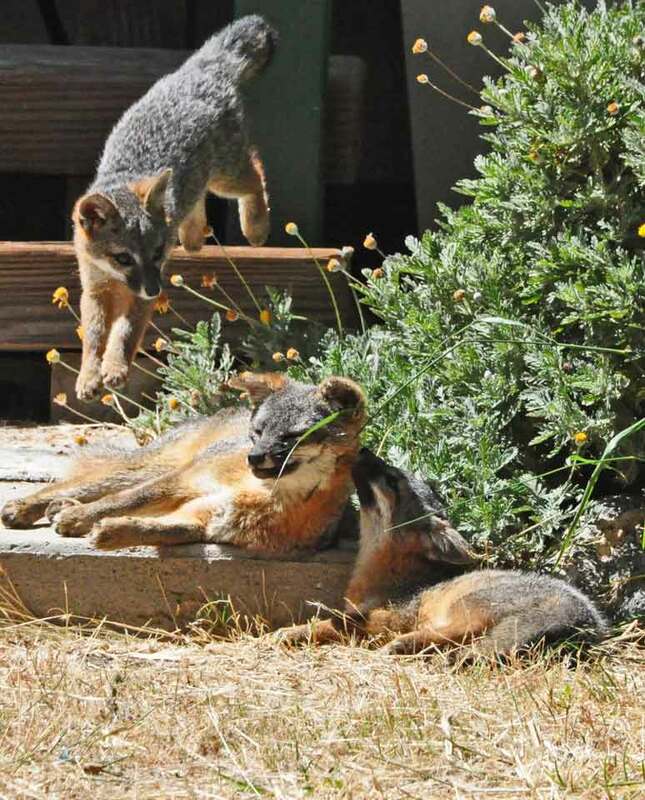 Affiliative Behavior: Island foxes are family oriented and pair bonded. They demonstrate caring and friendly behavior to family members. Female offspring remain in the same area as their parents and on occasion friendly behavior may occur between adult offspring and their parents or siblings. Familial Recognition or recognizing family members is a behavior that is being seen more as fox families build generations. This May we saw a young adult island fox (1-2 years old) approach an elder island fox sleeping curled up along the dry creek bed. The younger fox came right up to the older fox and sniffed it. The older fox did not growl or demonstrate any aggressive behaviors and the younger fox did not try to chase the old fox or intimidate it in any way. This interaction was completely different from the aggressive behavior seen between two other adults on the same day (see The Growl above). Do island foxes continue to recognize family members throughout their life and maintain friendly behavior toward them? (See - Two adult island foxes meet) This is definitely an area that needs further research. 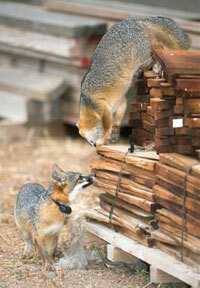 It is exciting that there are questions to be researched regarding island fox behavior. 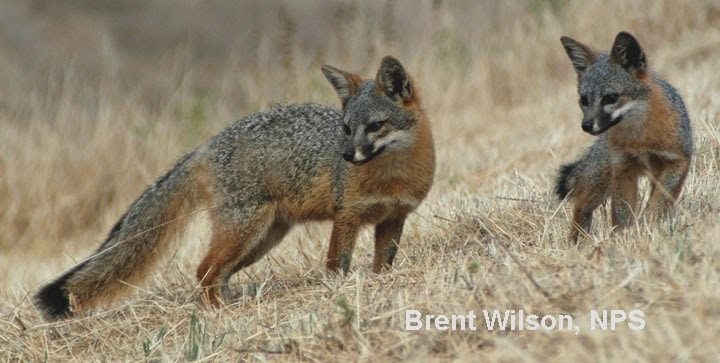 If we had lost the island foxes on Santa Cruz, Santa Rosa, San Miguel, and Santa Catalina Islands seventeen years ago, we would have also lost the opportunity to know this species better, to understand how it behaves, and how island isolation has changed its behavior from the mainland gray fox.